Note: some light spoilers for the game's opening act follow. If you want to go in completely fresh, come back and read this later. You've been warned. 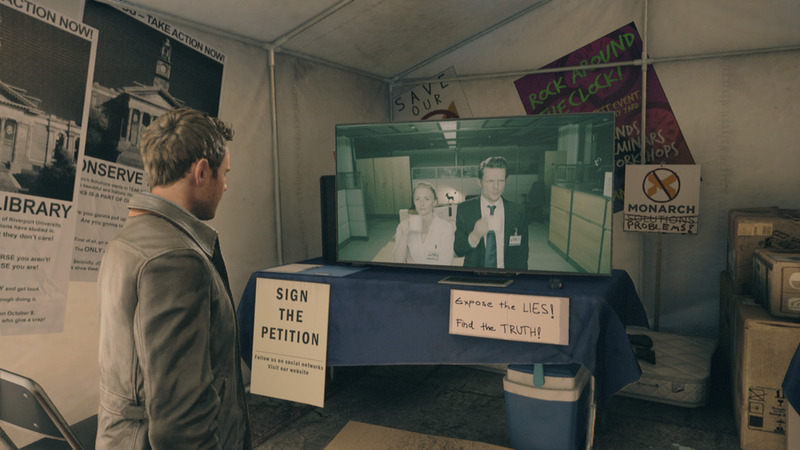 The game starts with a very low-key section that works as basic tutorial for movement and environment exploration as main character Jack Joyce walks through a college campus protest to meet his researcher friend who's called him to a secret, 4 a.m. meeting. I love exploring areas like this, which often are at the beginning of games, when you get the chance to breathe in a virtual world without the pressures of combat and action. The world here is lovingly crafted by developer Remedy Entertainment, previously of Max Payne and Alan Wake fame (more on that later). Console exclusives are often home to some of the best graphics since the developer can play to the system's technical strengths, and QB does not disappoint, with plenty of great details and finishing touches that make this campus very believable—almost tangible. The character models, too, look great and animate exceptionally, only rarely dipping into uncanny valley territory. Having snagged some decently recognizable actors, this helps bolster the game's cinematic approach. Without diving too much into the plot details, the setup revolves around the most-likely-evil Monarch Corporation, which is set on destroying Riverwood University's historic library to build yet another high-tech research facility on the campus. Students are unsurprisingly upset by this and have staged a final protest the night before the planned demolition. It definitely draws on some collegiate clichés, but it works well as a way to give you some context for some of the key players in the story without feeling overly expository. You'll see tents, posters, signs, volunteer stations, and a few mysterious figures. You could honestly breeze through this section in about one minute, but I probably spent a good twenty exploring every nook and cranny, talking to various students, meeting an undercover campus security officer, watching an in-world TV show, listening to the radio, and finding hidden clues about the game's story. For those willing to invest the time, QB really rewards those who go the (literal) extra mile in traversing the less-traveled paths of the game's world. There are extra clues to read, radios to listen to, even an in-world TV show to watch (expanding on ideas from Alan Wake). Although the world is ultimately a series of "walled gardens" and not any sort of open world, there are plenty of less-obvious areas to explore, most of which contain some small carrot for your trouble. Having some character interactions, especially with the lead protester, Amy (above, right), help give Jack a little more personality and flesh out setting a little beyond mere window dressing. None of the conversations are particularly groundbreaking, and you don't get any dialogue options, but they're a nice touch nonetheless. 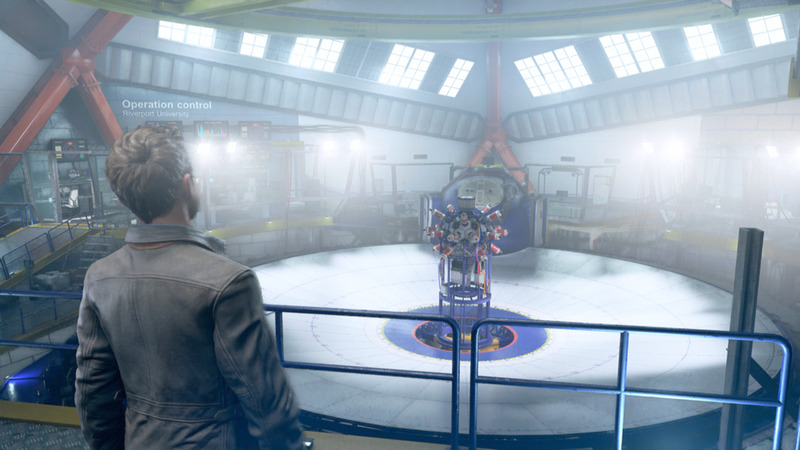 After you move through the campus exterior, you enter the gigantic, Monarch research facility that's already been installed at the university. 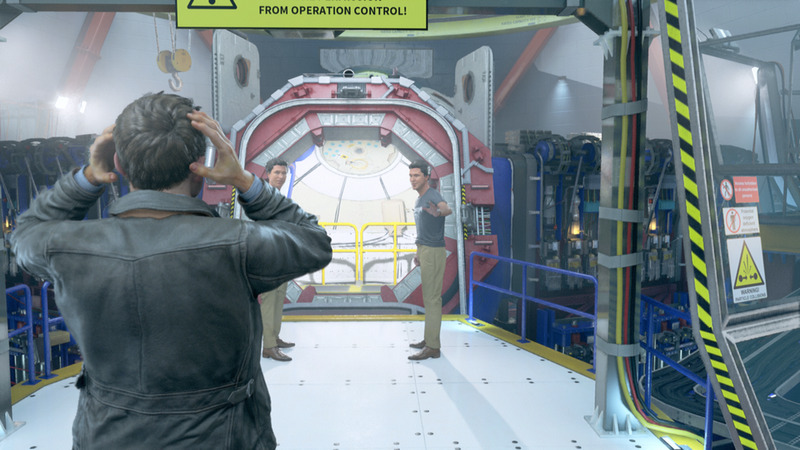 The game pays great attention to architectural detail, and I was very impressed to see, later, that below building's unique exterior design holds true on the interior as well. Once inside, you meet up with Paul Serene, Jack's long-time friend, who needs completing an experiment to save the funding for his project, which involves, of course, time travel. Again, developer Remedy does a great job building to the inevitable moment when the plot really kicks into gear, giving the player full agency to explore the lobby. Paul and Jack will continue to talk the longer you explore, which is a great treat for a slower-paced player like myself. I love the little, quiet moments in big-budget games, and QB delivers in spades in its first act with ample opportunity to stop and smell the virtual roses. I was way more excited by this than I should have been. After the PowerPoint fun, it's off to the laboratory. What's great about the visual design here is that it's not at all apparent at first how this crazy machine works or what exactly is going to happen. This helps keep the suspense in check and the focus on the characters as Paul drip-feeds information bit by bit to Jack about the experiment and Jack's part to play in it. I'll toss in another light spoiler warning if you really don't want to know what happens with the time machine. Okay, still here? Good, let's keep going. Basically, that thing in the center of the room manipulates time and space, and a circular tunnel pops up out of the floor around it. Jack sets the time machine a few minutes into the future, Paul's character goes into the tunnel, and suddenly a second Paul is standing there: Paul from five minutes from now. He just needs to walk back into the tunnel to "close the loop," but that's when things go sideways. 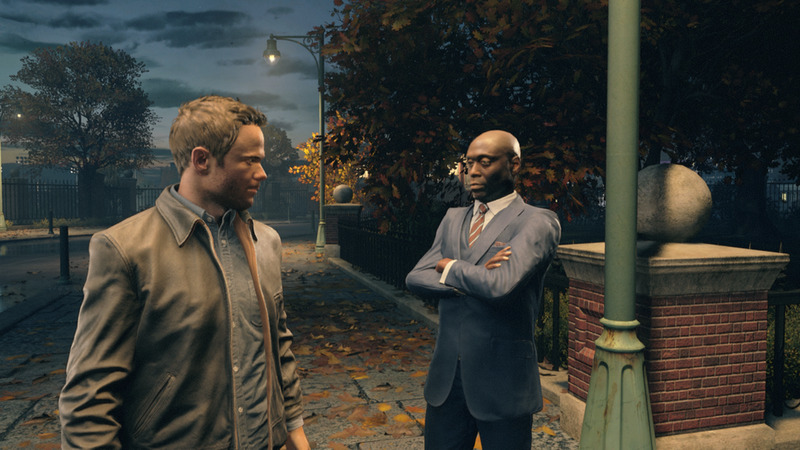 Jack's brother, William (above, right), who had been part of this project until he started working to shut it down over "concerns," shows up and prevents Paul from closing the loop, which causes time to fracture or "stutter," as they call it, setting the stage for the rest of the game. It's decent enough take on a time machine story, and it's nice to see the developer just dive right into the craziness with just the right amount of exposition. I will say that I thought it wasn't very clear why William intervened in this otherwise smooth experiment, but with a time travel story, it will be easy for the plot to fill this gap later in any number of ways. The visuals of the time stutter are really quite neat, with furniture floating in the air and strange geometric shapes that act like tiny shards of glass that refract light. All of the floating bits even react to you walking into them—another tiny detail that just adds to the grounded nature of an otherwise surreal experience. There's plenty more to be said about the actual gameplay (i.e. the stuff you do beyond just walking around), which kicks in shortly after the events described above, as well as the live-action TV episodes and branching narrative paths, but I'll save all of that for another post. For now, just know that the bending time to fight evil soldiers is extremely satisfying in an unusual way, much like Remedy's previous games. 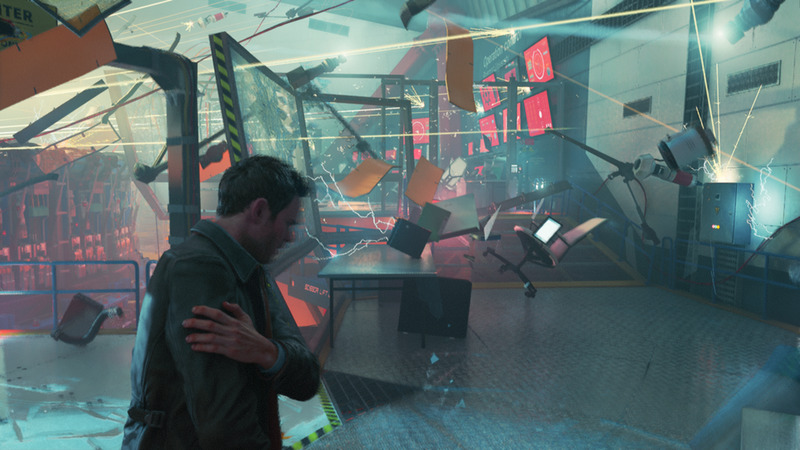 I still have much more to discover in the world of Quantum Break, but it's really shaping up to be a great reason to own an Xbox One. See you next time.